North Dallas is known as a place of prosperity, posterity, power, and position. Though not as endearing, some would add privilege, even pretention to that list. 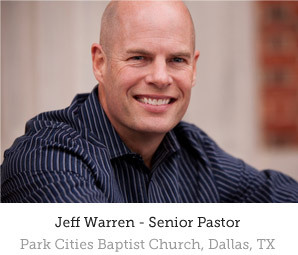 I serve as the senior pastor of an amazing church in the center of North Dallas. The Park Cities Baptist Church is located in the township of University Park, one of the most affluent zip codes in the nation. In light of recent debate over issuing bans and building walls, our church family has been faced with the very real question: What is the Christian’s response? How do we live in this tension between upholding the law and displaying love to the most vulnerable among us? Augustine spoke of the profound unity of Scripture, reflected in his famous “rule of love”? According to Augustine, whoever “thinks that he understands the Holy Scriptures, or any part of them, but puts such an interpretation on them that does not tend to build up the twofold love of God and our neighbor, does not yet understand them as he ought” (Christian Doctrine, 1.26.40). Love of God and love of neighbor is our final exegesis. It is, in fact, the final proof that we are followers of Jesus. We must always follow the rule of law while always practicing the law of love. Jesus’ challenge to “render unto Caesar”, challenges us to ask two questions: “What does not belong to God?” And, “Doesn’t Caesar himself belong to God?” I’ve told our congregation that we will leave the security and safety of our nation to our governmental leaders. But we do not need politicians to tell us how to treat outsiders. 1 Peter 2:14 says that those who govern over the nations are “sent by Him to punish those who do evil and to praise those who do good.” The first priority of government is the safety and security of its citizens. We believe that we must live in a land of law and order. There must be a rule of law. Chosen leaders are called to protect their citizens. As Christians, we know too that we are citizens of another kingdom and we are ambassadors of another King. Exodus 23:9 says, “Do not oppress a foreigner; you yourselves know how it feels to be foreigners, because you were foreigners in Egypt.” Jesus told us we are to invite the stranger in. We are to give to the hungry, the thirsty, and the stranger who is sick or needs clothes to wear. In fact, He so identifies with the outsider, He says when we serve them, we are serving Him (Matthew 25:25-36). Galatians 5:14 says, that “the entire law is fulfilled in keeping this one command: “Love your neighbor as yourself.” Paul tells the church to “walk in wisdom toward outsiders, making the best use of the time. Let your speech always be gracious, seasoned with salt, so that you may know how you ought to answer each person” (Colossians 4:5-6). John 13:34-35 says “A new commandment I give to you, that you love one another: just as I have loved you, you also are to love one another. By this all people will know that you are my disciples, if you have love for one another.” We are filled with the Spirit, united in the Spirit and we love all people as Christ has loved us. Exodus 34:6-7 says, “the Lord, the Lord, a God merciful and gracious, slow to anger, and abounding in steadfast love and faithfulness… forgiving iniquity and transgression and sin, but who will by no means clear the guilty…” The rule of love has order built into it. Our church family is constantly confronted with the fact reality, “to whom much is given much is required” (Luke 12:48). One of the core values that drives us is, “overflowing generosity”. Our church is filled with generous Christ-followers who are eager to give away and to share with others. We’ve been blessed to be a blessing. Our members have been serving the Vickery area for over 30 years. I t all started as God prompted a few of our members to start a Bible study for a small group of Spanish-speaking women. After years of ministry in the area in a variety of ways, we began a Bible study in our mission office that soon grew into it’s own service and finally became one of our five venues on campus every Sunday morning. It is a bilingual service, but the members are integrated into our ministry programs, mission efforts, camps, Wednesday night opportunities, and Connect groups. In every way, this a portion of our congregation, are valued members as much as any other group within our church family. We have several deacons who have come out of the “PCBC En Espanol” portion of our congregation. They are a vibrant part of our family who are teaching the rest of our congregation how to pray, serve, and worship the Lord with great passion and energy. Out of this single Bible study years ago has come multiple Bible studies, women’s groups, and mentoring for children through the years. Annually we have served the community at the beginning of the school year. Most recently we provided 1,200 backpacks, 350 teacher supply boxes, 300 eye exams, 100 athletic physicals, and 500 immunizations. We have had 15 different teacher appreciation lunches and breakfasts in Vickery Meadow schools. We have distributed food backpacks on the weekends for the most needy children. We also provide a kind of Spring cleaning, refurbishing, and landscaping. We currently support eight refugee congregations: Burmese, Nepalese, Kenyan, Indian, Arabic, and several Spanish-speaking congregations. God’s love for this community is leading us to the completion a 6,500 square feet, Community Care Center for training refugee and immigrant pastors, ESL classes, after school care, church planting, healthcare, women’s groups, and a ministry among the Royhinga people group, of which, there are no known believers. Jana Gardner, one of our church members, started Healing Hands, a Christian clinic for the uninsured. Last year Healing Hands served 12,000 patients, nearly all refugees and immigrants. Over 100 people have come to Christ, and they are ready to plant a church for the new believers. Most recently, our church hosted a city-wide leaders’ meeting for those who serve refugees and immigrants. Our purpose was to equip ministry leaders with accurate information, resources, and best practices for caring and serving those in need. Among the leaders present was Mike Rawlings, the mayor of Dallas, our county judge, pastors, ministry organizers, volunteers, and others who simply want to get involved. It was a wonderfully diverse gathering that brought factual information to many who are misinformed. We also heard from a refugee family, the struggles of a father and his children, who were present as well. Leaders shared best practices and we provided opportunities to get involved. We experienced again, the very presence of Jesus, who told us that when we serve the most vulnerable among us we are actually serving Him. I challenge every pastor, church planter, ministry leader, and every church to pray, look around you, and see if God is calling you to serve refugees and immigrants. We care and serve, all in the Name of the One who was Himself an immigrant, living in a foreign land. He came from the very top, all the way down to where we are, to lay down His life so that we too might live. The Gospel drives us to go do likewise. May we follow Him, and none other, to be salt and light to the misplaced and marginalized, to the immigrant and refugee.